Weis abandons her uncompleted Sovereign Stone Trilogy (Guardians of the Lost, 2001, with Tracy Hickman) to kick off a new solo effort. The fair virgin Melisande, at 28, is High Priestess in the monastery of the Amazonian order, overlooking and protecting the people of the valley of Seth. Fresh virgin warriors for the order are produced by nine members—called cows—who are kept aside for giving birth (male babies supposedly are given to needy folk in the valley). Her lover is dark-haired Bellona, chief warrior, and her chief enemy in the order is Lucretta, jealous that the current Mistress of Dragons—70, white-haired, and bent—has chosen Melisande to replace her when she dies. As Melisande conducts her morning rites at the Chamber of the Eye, she sees a lone male dragon approaching and alerts the warriors, but the Mistress of Dragons, leading her priestesses in magic spells against the dragon, suddenly collapses, although the marauder is driven off. Centuries before, the Dragon Wars with humans ended and the Parliament of Dragons formed, ruling that dragons must keep from human affairs. 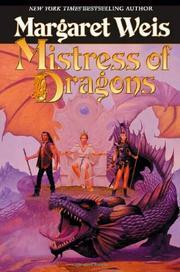 Maristara, however, took over Seth and rules there, teaching the humans dragon magic. The only human form to attend the Parliament is Draconas, a warrior male who, as the Parliament’s servant but actually a dragon himself, can think in images along with the dragons. It’s suggested that Draconas be sent to Seth to abduct the Mistress of Dragons and bring her back to help find a way of overcoming Maristara. Draconas hoodwinks Edward, King of Ramsgate, to accompany him to Seth. Draconas and Edward repulse hired assassins on the road, but Draconas determines that Maristara is trafficking in the male babies of the “cows” and has left a door open in Seth’s magic shield. The bang-up climax finds Melisande giving birth to twins, one wholly human, one half-dragon, as the pot boils for volume two.